As you know, xorg.conf is a X window system server configuration file. This configuration file is searched for in /etc/X11 folder when X server is stared. It allows you to configure your screens and graphics divers. 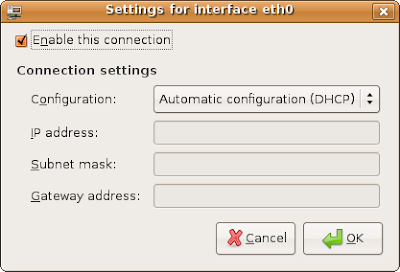 Now, you can do it in Ubuntu 7.10 (Gutsy Gibbon) with the support of a graphical user interface. This tool makes the configuration of X Window easier. 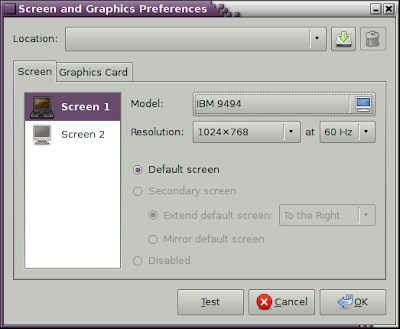 Then, you can select your graphics card and a right resolution of your screen. The configuration file xorg.conf will be updated automatically after you click "OK" button on this tool. Ubuntu Linux is better and better. Have you already installed Ubuntu 7.10 (Gutsy Gibbon) ? 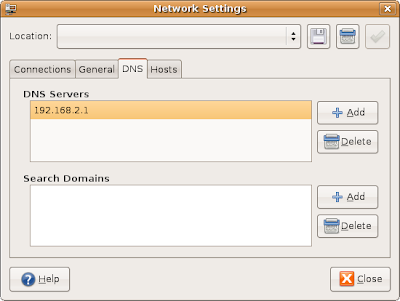 If not, you should read this post to know how to install a new Ubuntu Gutsy. Okey! 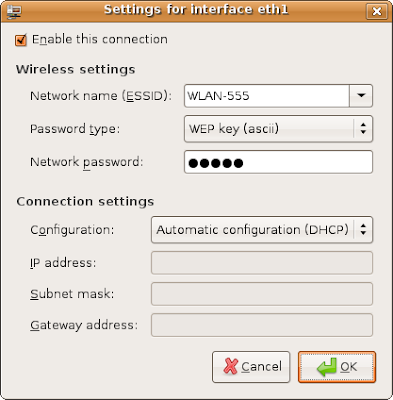 If Ubuntu Gutsy is available, you can follow the following steps to setup extra packages to play DVD and listen to MP3 music. There is no monitor signal while booting Ubuntu Gutsy. Just only a bank screen during booting the system. This problem is also seen again after you shutdown the Ubuntu Gutsy. How can you fix this problem? Don't worry! Hopefully, this post can help you to solve the problem. First, you should install a startup manager. This tool allows you to change settings in the bootloader and splash screen in Ubuntu Gutsy. Run the following line in your terminal to install this tool. 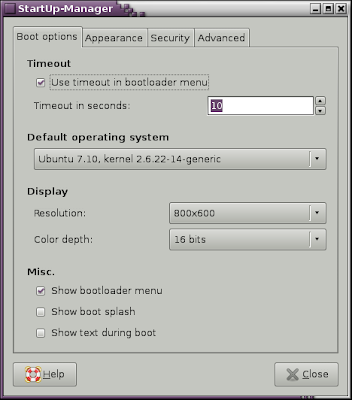 Look at the bottom of the window, you have marked all options (Show bootloader menu, Show boot splash, and Show text during boot) like the following picture. Click "Close" and continue to next step. Save file and reboot your Ubuntu box to see the effect. What is your result? You can download Gutsy Gibbon from Ubuntu site or Ubuntu mirrors. 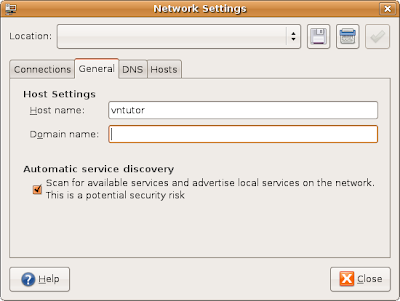 An Ubuntu 7.10 Gutsy torrent can be downloaded directly here. However, if you are using Ubuntu 7.04 ("Feisty Fawn"), you can upgrade to Ubuntu 7.10 ("Gutsy Gibbon") easily via Update Manager. Now, if you are a new user, you can have a look to see what I have done. It's easy to install in 7 steps. So, after 28 minutes (from 18:59 to 19:27) Gutsy Gibbon is ready on my old notebook (CPU 1.3G). It's nice to see a world of free open sources. The KDE Project today (October 16th, 2007) announced the immediate availability of KDE 3.5.8, a maintenance release for the latest generation of the most advanced and powerful free desktop for GNU/Linux and other UNIXes. KDE now supports 65 languages, making it available to more people than most non-free software and can be easily extended to support others by communities who wish to contribute to the open source project. Improvements in Konqueror and its web browsing component KHTML. Bugs in handling HTTP connections have been fixed, KHTML has improved support of some CSS features for more standards compliance. In the kdegraphics package, lots of fixes in KDE's PDF viewer and Kolourpaint, a painting application, went into this release. The KDE PIM suite has, as usual, seen numerous stability fixes, covering KDE's email client KMail, the organizer application KOrganizer and various other bits and pieces. VnTutor have generated a VIM commands cheat sheet v1.0 for new VIM users. However, it is also needed professional for users as references. In this cheat sheet, commands with similar functions are grouped together. Print it out and stick it on your wall if possible! This is a list of essential keyboard shortcuts for Linux Gnome. Please leave your messages for new ones! sources.list is a package resource list used to locate archives of package distribution system. In Ubuntu, this control file is located in /etc/apt/sources.list to support APT for searching, updating, and installing packages. Each line is one separate source written in a given syntax. You can customize this file by adding or removing any source you want. However, what is the problem if you are not sure how to modify it or currently your sources.list doesn't work well. You don't need to worry about that because you can use Ubuntu sources.list generator. With this generator you can create your own custom sources.list from various available sources. It takes only two simple steps. 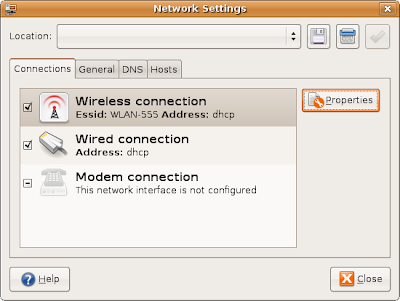 First, you select your country, Ubuntu version, and the architecture of your computer. Second, you take any repositories you like and click "Create sources.list" button to generate the content of your sources.list file. And I think that you know what to do then.